EKO 35L Grace stainless steel pedal bins are a family-sized, hands-free dustbin. The lid soft-closes automatically when the pedal is released; quietly, thanks to the built-in noise damper system. This EKO stainless steel litter bin has a removable plastic liner to catch leaks and spills, keeping your home more hygienic. The liner also protects plastic bin bags from tearing. This attractive stainless steel pedal bins has a fingerprint-proof finish to keep the bin looking its best. It's superior waste maintenance--elegant, comfortable, and very functional. The EKO 35L Grace stainless steel pedal bins are large-sized and hands-free. Perfect for larger bathrooms, kitchens Utility and laundry rooms, this attractive bin perfectly combines style and function. With a flat back and front and angled sides, it sits flush against the wall to maximize your space. Its front step lever opens the lid and keeps it open for easier use. Its soft-close automatically closes the bin when you lift your foot off the lever. It has a plastic-bag fixer to hold your bin bags liners in place. 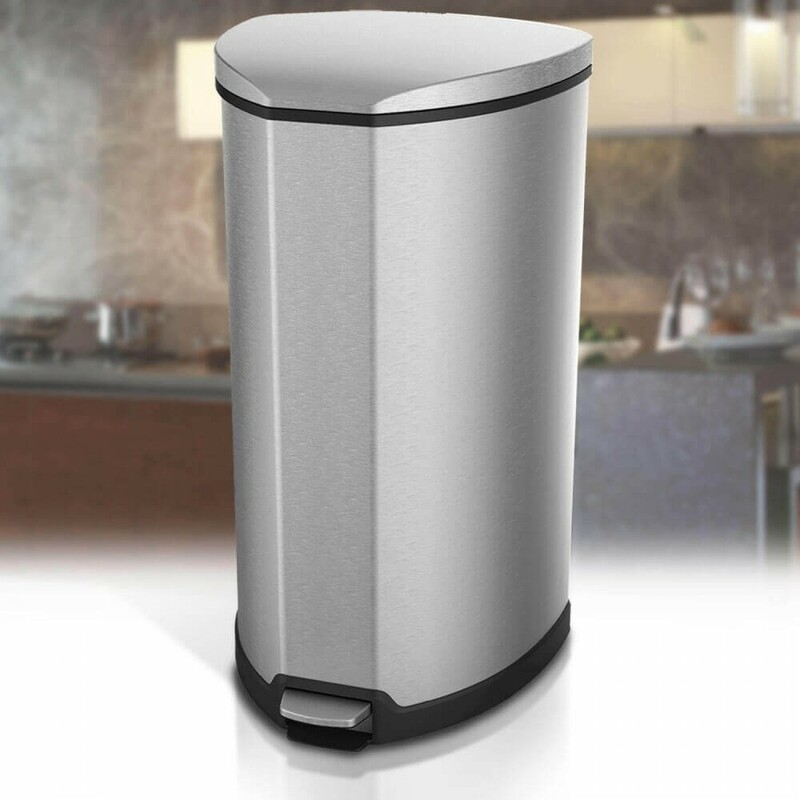 The stainless-steel finish has a special finger smudge & smear print-proof processing to keep the dustbin clean. With nearly soundless operation, the EKO 35L Grace stainless steel pedal bins gives you the touch of class you want in your waste bins--stylish, discrete and Practical. Distinct curves and edges are what separates Grace Step Bin from the rest of the household bins in the market. Inspired from waterfalls, Grace Step Bin's seamless triangular shape amplifies the majestic and powerful beauty of nature. You will be delighted at how Grace Step Bin compliments your living space while providing you with features that makes waste management in your house a breeze. Top notch craftsmanship and workmanship gives Grace Step Bin its edge in design and durability. Made from high quality stainless steel with fingerprint resistant processing, Grace Step Bin protects itself from fingerprints with dignity. A modern bin is not complete without soft closing lid. No household should endure a noise generating bin whenever you throw rubbish. Grace Step Bin is equipped with bi-force damper system that soft closes the lid. Noiseless and graceful. Looking for a bin that gives your kitchen character? Grace Step Bin's flat back does not intrude into your living space yet it's iconic shape compliments and enhances your kitchen and other areas of your interior space. The Grace models completes with stay open function that is perfect for kitchen, bedroom and living room especially when you need to host friends and business associates over for gatherings. Features Unique, triangular foot pedal bin with plastic liner bucket and soft closing lid.